Sometimes I buy snacks without the intention of blogging about them. 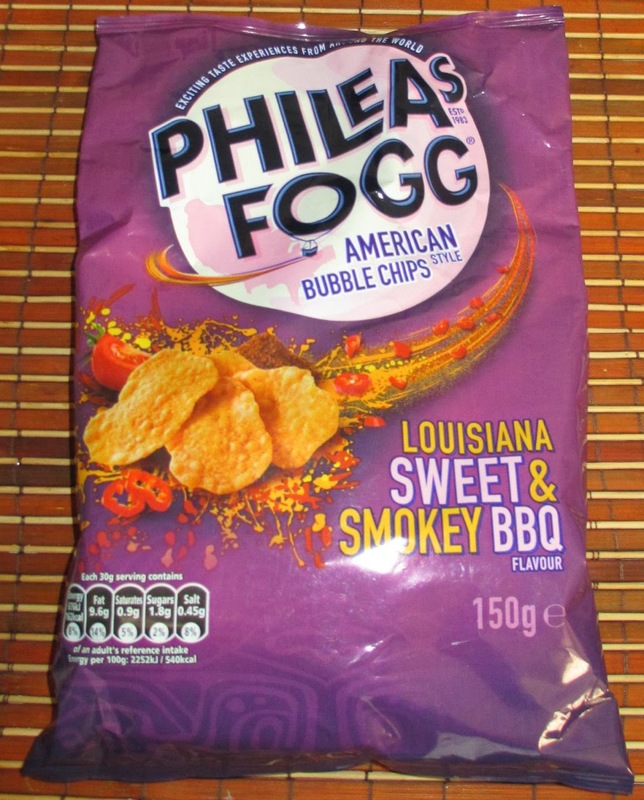 They just sound nice, and in the case of these Phileas Fogg Bubble Chips I thought I’d written about quite a few Phileas Fogg goodies already on Foodstuff Finds, and although they are new to me I don’t think they are newly out. The thing is when I gave them a try all that got turned on its head and I knew they were very much blog worthy. These ‘chips’ are mostly round in appearance, and look quite thick, but as they have air in them they do still have a light crunch. The taste is where them come alive, they are just so full of flavour. There is some dark pink/orange seasoning on them and the aroma from it is enough to let you know these are going to hit the spot. The taste is sweet, but warm and spicy. I could pick out barbecue sauce, sweetness from tomato, spice with a little chilli, a fab hint of smokey flavour and even some onion. There is a lot going on there, but they work like a dream. It has been a while since I enjoyed a bag of crisps so much. The crisps do have a strong taste, but I like that and I found myself liking my fingers after I’d finished. If you are looking for a bag of crisps that delivers an unequivocal barbecue taste with a moreish crunch, these are the crisps you’ve been looking for. I agree, these crisps are so good! Just wish they'd release smaller bags as it does nothing for my health when I can't seem to stop eating them until they are finished.